POLITICS? 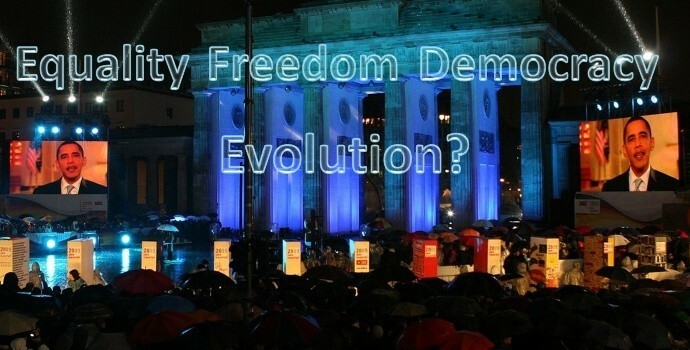 Evolution is pure science, so how can it have anything to do with politics and morality? The original question was: Evolution is pure science, so how can it have anything to do with politics and morality? Why don’t you stop using red herrings to impose your religion onto the science classroom? Let’s start by asking an American question; “Have All Men Evolved Equally”? and follow it by asking secular humanists, particularly in the USA and also around the globe, if they realize the terrible dilemma they’re facing when they embrace the theory of evolution while clinging tightly to cherished human rights such as those codified in the Constitution of my homeland, the United States of America, and attributed originally to God as Creator? This must present quite a conundrum, especially for professing Christians who side with evolutionists on the matter of origins. For example, perhaps the most famous secularist on the planet today is President Barack Obama who is a paragon of secularist values, including his belief in evolution, but also oddly lays claim to the Christian faith. Granted, the church where he worshipped for some twenty years in Chicago practices a version of Christianity that seems foreign to me. They espouse something called the gospel of social justice which, to me, seems bent of establishing some kind of utopia on earth rather than focusing on the gospel of Christ and his kingdom which is not of this world. In any case, let’s get back to the point of my example. It is intellectually and logically impossible to believe in evolution if you claim we’re endowed with certain unalienable rights by our Creator God. It is where the rubber of evolution/creation meets the road of politics or morality. I’m not surprised that President Obama elected to leave out a reference to our Creator. He, like secularists in our nation and Western Europe, is a firm believer in the settled science of evolution. I’m not here to argue the point that evolutionary theory is not science at all but rather an alternate expression of faith. That’s a debate for another day. Nonetheless, isn’t it strange, even bizarre for a secularist and evolutionist to claim that all men and women are created equal, when we’ve arrived here through evolution, which is a process of random chance naturalism that is the antithesis of intelligent design? Is Obama’s use of the term “created” just the cavalier application of literary license? No, I’m sure they’d like to avoid the term altogether if possible but that would be most difficult thanks to the precise terminology of America’s Founding Fathers. The best excuse they can offer is that the term “created” is used loosely to imply evolution; a concept beyond the scientific limitations of the 18th Century. This, plain and simple, is pure sophistry – poppycock aimed at blurring the clear intentions of the Founders. So let’s take this at face value, and I think you’ll see what I mean. If you think we’ve evolved rather than being created by the ultimate intelligent designer, our Creator God, how on earth can you claim that we’re all equal? Evolution is a deadly, bloody, tooth and claw struggle where natural selection vanquishes the weak and favors the strong. We all started from a single cell in primordial goo, and the race was on. After eons of death, extinction and supposed transformation from one kind of being to another, we’ve reached a point in time where humans, for the moment, just happen to be at the pinnacle of the evolutionary hierarchy. If we had all evolved equally would we need to be a perfectly homogenous species because that is what we are not! So the evolutionists must try to explain away the diversity of creatures in existence, and then address differing human subgroups in the species. Can we ever be equal on the basis of evolution when we know that some human racial groups have genetic diseases that others don’t, etc? The reality is there’s no way we can evolve equally as then there could be no ‘natural selection’ based on gene difference, so man could not evolve ever unless we are all at different points of superiority and inferiority all along our evolutionary paths. So it becomes logically impossible to extend this ‘science’ to the politics of equality. The bottom line then: the theory of evolution is diametrically opposed to the moral and political principles espoused by America’s founders and many other free peoples around the globe. The two cannot coexist in any form of logical intellectual honesty. So let’s face it, the issue of origins is one that is inextricably linked to morals and to politics and religion, etc. There is no way to avoid this. Isn’t it amazing how the ideals of freedom from slavery, equality of opportunity, etc. which Americans and like-minded free peoples everywhere hold so dear, are however perfectly consistent with the truths of the Bible that; “God created man in his own image, in the image of God created he him; male and female created he them” (Genesis 1:27). “This is the book of the generations of Adam. In the day that God created man, in the likeness of God made he him” (Genesis 5:1).” I have made the earth, and created man upon it: I, even my hands, have stretched out the heavens; and all their host have I commanded“ (Isaiah 45:12). “Have we not all one father? Hath not one God created us” (Malachi 2:10)? We’re obviously not equal according to the naked eye. We do have differing gifts and abilities (I Corinthians 12). Yet, the Bible’s teaching is that we are all equal in the eyes of God. He alone has the ability to look beyond our often superficial cultural exteriors and peer into our hearts and ponder our souls. His role as our Creator is what enables Him to endow us (His creatures) with certain unalienable rights, and those rights are based exclusively on and indivisibly from His inalienable authority as Creator. If we forsake the Creator God for the lie of evolution, we forsake all, and political and moral concepts such as equality, freedom and democracy are included in that. For more information on this issue, watch the World View Seminar DVD, available from the Creation Research webshop. Background image: President Barack Obama’s video message at the Freedom Festival in Berlin, Germany, marking the 20th anniversary of the fall of the Berlin Wall, Nov. 9, 2009. Steve earned an undergraduate degree in education with a major in history from the University of Missouri and a master’s degree in business management from Maryville University. He worked as a high school teacher and coach before enjoying a long, successful business career in the aerospace and international brewing industries. Steve has been privileged to serve as the long-time chairman of the board of elders at Trinity Evangelical Lutheran Church. 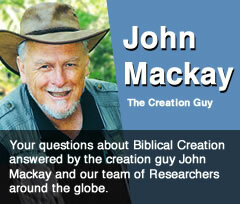 It was there that he had the pleasure of first hosting John Mackay of Creation Research of whom he is proud to claim as a friend and brother in Christ. Most recently, Steve has retired from business to pursue a new career, his life-long dream of becoming an author. Steve’s bailiwick is Christian fiction wherein he loves to spread the gospel in the context of mysteries, thrillers and fantasies. His books include Asunder: The Tale of the Renaissance Killer, Murder by Chance: The Blood Moon Lunacy of Lew Carew; a two-part series, The Last Prophet: Imminent End & Doomsday Diary, Cha-Cha Chandler: Teen Demonologist, Tracts in Time and a non-fiction commentary, Straight Talk about Christian Misconceptions which are available in paperback and Kindle at amazon.com.